AR500 Armor® Chest Body Armor is designed to be worn in the front or back of a plate carrier. 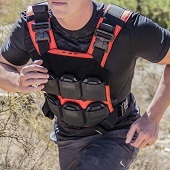 We offer our body armor in a variety of sizes to accommodate nearly all plate carriers on the market, including 8" x 10", 10" x 12", and 11" x 14" chest plates. AR500 Armor also features our Patented (US9021612 B1 5May2015) Advanced Shooters Cut; our unique cut which allows the operator to better position their rifle while wearing armor that provides maximum coverage without being restrictive to position or posture changes, a distinct advantage over traditional cuts. All AR500 Armor® Body Armor is 100% made in the USA and manufactured from our rugged and reliable ballistic core designed specifically for Armor applications.